First conceived in 2013, Star Park was identified as a priority for the city, which had no dedicated playground for children, Sweeney said. Funding from the state legislature for the park was denied until 2015, when the state Recreation and Conservation Office awarded a grant of about $230,000. The city will match the grant with more than $100,000 in local donations and volunteer time, Sweeney said. The 12,000-square-foot park will go in just east of Pioneer Park. To design the park, the city hired Leathers & Associates, an Ithaca, New York-based firm that gets ideas for park features from local children. 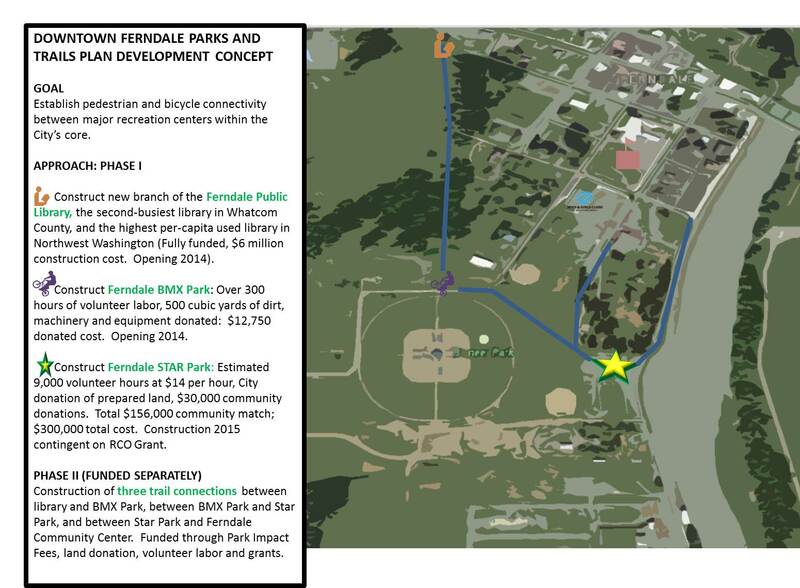 Kindergartners, third- and fifth-graders from Ferndale schools provided ideas for the park’s design. Some ideas were specific, including a spaceship and a treehouse. Other submissions asked that there be plenty of places to climb, run and jump, Sweeney said. The spaceship and the treehouse are both in the park’s final design. Most of the park’s features, Sweeney added, are accessible for those with disabilities. A contest organized in April aimed to decide on a Metallica logo to go on a miniature bridge in the park’s design. The idea, Sweeney said, was to pay tribute to the Metallica graffiti logos that have for decades showed up on the side of the railroad bridge that spans the Nooksack River near downtown. The city has since decided to paint “Ferndale” on the side of the playground bridge in the style of the Metallica logo that appears on the metal band’s “Ride the Lightning” album. Though no complaints were filed against the city, Sweeney said the change was made to avoid any potential intellectual-property violations from using the actual Metallica logo. When it comes time for work to begin Tuesday morning, there will be plenty to go around, Sweeney said. In addition to building fence, drilling holes and assembling playground equipment, volunteers are needed to check tools in and out, serve food and do other tasks. All volunteers, Sweeney said, will be fed for free. A variety of local restaurants are providing the meals. Organizers also are in need of tools, particularly circular saws and power drills. Tools donated for the five days of work will be checked in and out, and replaced by the city if damaged, Sweeney said. Volunteers should wear clothes that can get dirty, as well as close-toed shoes. A list of other frequently asked questions for volunteers, including where to park and other details about the shifts, is available on the city’s website at cityofferndale.org/starpark. Volunteers can register at the city of Ferndale’s website at cityofferndale.org. Where: Just east of Pioneer Park. When: Work begins at 8 a.m. Tuesday, May 31, with morning, afternoon and evening shifts until Sunday, June 5. What to bring: Clothes that can get dirty and close-toed shoes.